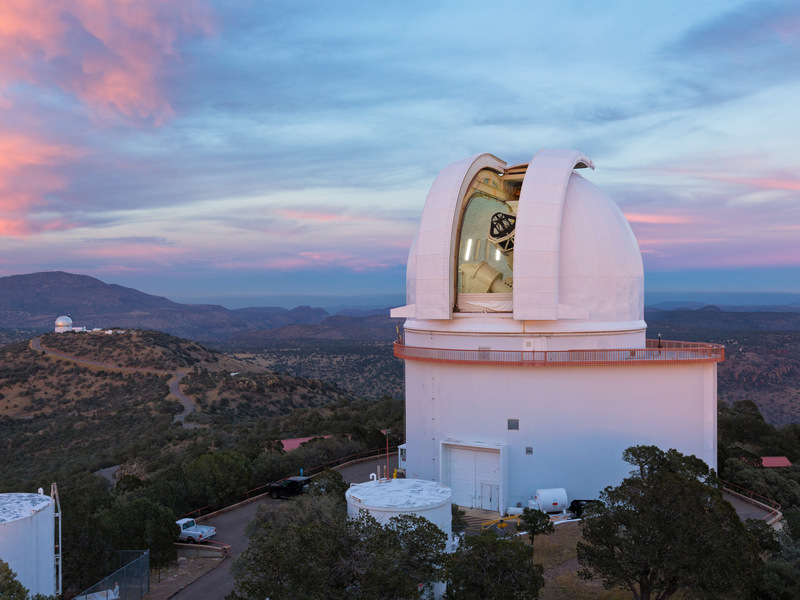 Astronomers used the Harlan J. Smith Telescope at the University of Texas at Austin’s McDonald Observatory near Fort Davis, Texas, to search for a planet around star CI Tau. Image credit: Ethan Tweedie Photography. In contradiction to the long-standing idea that larger planets take longer to form, U.S. astronomers have just announced the discovery of a giant planet in close orbit around a star so young that it still retains a disc of circumstellar gas and dust. Christopher Johns-Krull. Image credit: Jeff Fitlow/Rice University. CI Tau b is at least eight times larger than Jupiter and orbits a 2 million-year-old star about 450 light-years from Earth in the constellation Taurus. Johns-Krull and a dozen co-authors from Rice, Lowell Observatory, the University of Texas at Austin, NASA and Northern Arizona University made the peer-reviewed study now available online. 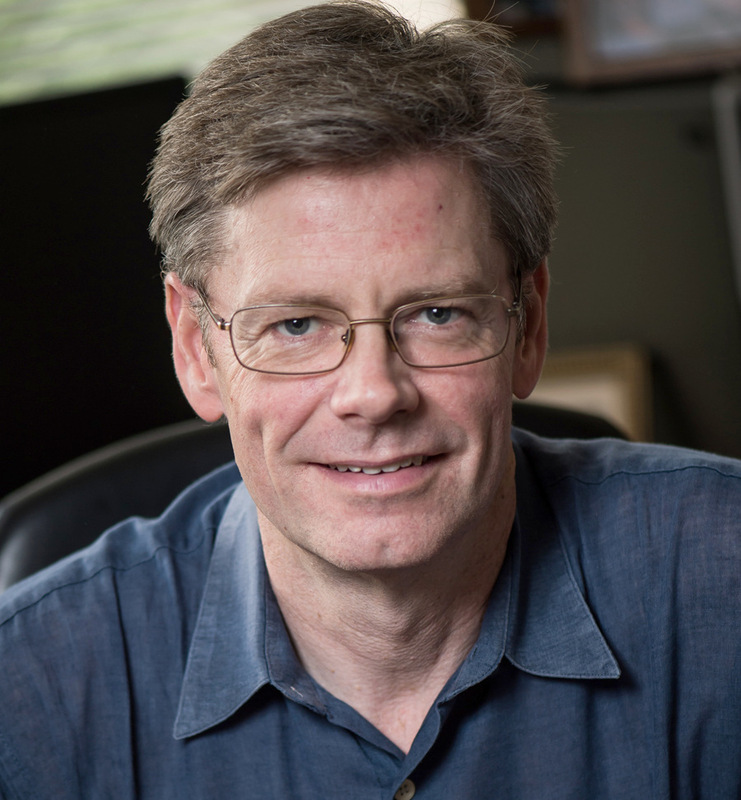 Earth and the Sun are more than 4 billion years old, and while the 3,300-plus catalogue of exoplanets includes some older and some younger than Earth, the obstacles to finding planets around newly formed stars are varied and daunting, Johns-Krull said. There are relatively few candidate stars that are young enough, bright enough to view in sufficient detail with existing telescopes and still retain circumstellar discs of gas and dust from which planets form. Stars so young also are often active, with visual outbursts and dimmings, strong magnetic fields and enormous starspots that can make it appear that planets exist where they do not. CI Tau b orbits the star CI Tau once every nine days. The planet was found with the radial velocity method, a planet-hunting technique that relies upon slight variations in the velocity of a star to determine the gravitational pull exerted by nearby planets that are too faint to observe directly with a telescope. The discovery resulted from a survey begun in 2004 of 140 candidate stars in the star-forming region Taurus-Auriga. Lisa Prato. Image credit: L. Prato/Lowell Observatory. Additional team members were Patrick Hartigan, Naved Mahmud, Wei Chen, Wilson Cauley and Joshua Jones, all of Rice; Christopher Crockett and Brian Skiff of Lowell Observatory; Daniel Jaffe, Jacob McLane and Gregory Mace of the University of Texas at Austin; and Charles Beichman of NASA’s Jet Propulsion Laboratory. 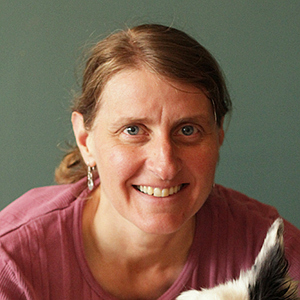 Cauley is currently a postdoctoral researcher at Wesleyan University, and Crockett now writes for Science News. The team observed CI Tau dozens of times from the University of Texas at Austin’s McDonald Observatory near Fort Davis, Texas; the Lowell Observatory in Flagstaff, Arizona; the NASA Infrared Telescope Facility and the Keck II telescopes on Maunakea, Hawaii; and the Kitt Peak National Observatory’s 2.1- and 4-metre telescopes in southern Arizona. This false-colour image from a submillimetre interferometric telescope shows the circumstellar disc of gas and dust that surrounds star CI Tau. Illustration credit: Stephane Guilloteau/University of Bordeaux. 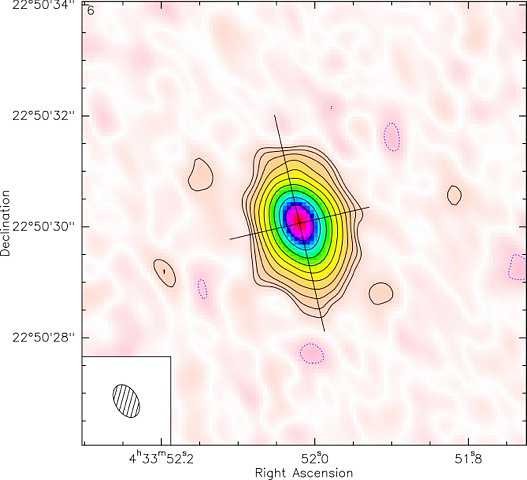 Initial optical radial velocity data from McDonald Observatory confirmed that a planet might be present, and the team added photometry measurements from Lowell and five years of infrared observations from Hawaii, Kitt Peak and McDonald to rule out the possibility that the optical signal resulted from starspots or another masking phenomenon. Johns-Krull said the team has examined about half of the young stars in the Taurus-Auriga survey sample, and the data from several of these suggest that more planets may be found. 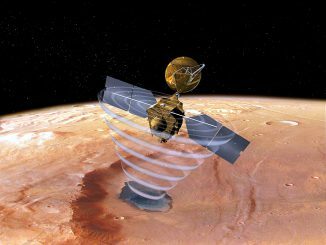 Researchers using NASA’s Mars Reconnaissance Orbiter have determined that frozen beneath a region of cracked and pitted plains on the Red Planet there lies about as much water as fills Lake Superior, largest of the Great Lakes. Scientists examined part of Mars’ Utopia Planitia region with the orbiter’s ground-penetrating instrument, revealing a deposit more extensive in area than the state of New Mexico. 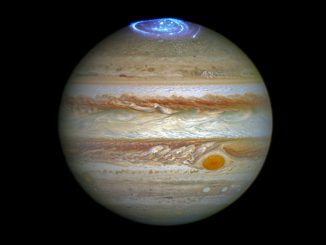 Astronomers are using the NASA/ESA Hubble Space Telescope to study aurorae — stunning light shows in a planet’s atmosphere — on the poles of the largest planet in the solar system, Jupiter. This observation program is supported by measurements made by NASA’s Juno spacecraft, shortly to arrive at the gas giant. 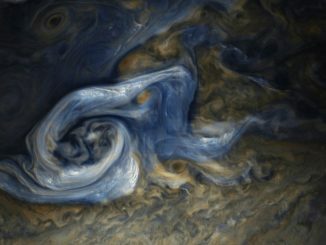 This colour-enhanced image of a massive, raging storm in Jupiter’s northern hemisphere was captured by NASA’s Juno spacecraft during its ninth close flyby of the gas giant planet.